Many people who work in an office end up spending the majority of their day staring at a screen. While this kind of work is becoming the new normal, there are health factors that must be considered. Eyestrain and dry eyes are major factors that need to be addressed when working long hours in front of a screen. Let’s take a look at some tips for avoiding eyestrain and dry eyes. 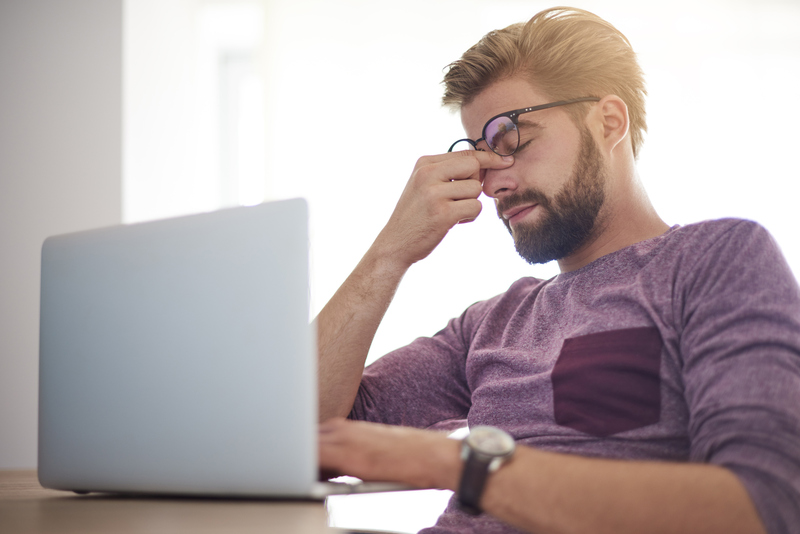 Eyestrain can be uncomfortable and irritating but there are several steps you can take to minimize it and ensure proper eye health for the long term. The most common signs of eyestrain include sore, burning or itchy eyes, blurred or double vision, headache, sore neck, increased sensitivity to light, or the nagging feeling that you can’t keep your eyes open. The American Academy of Ophthalmology suggests a few simple precautions you can implement in your workplace. Doctors recommend keeping your computer monitor roughly 25 inches away from your eyes. Arrange your desk accordingly so that you can keep it at that distance. Adjust the type size on your computer if needed if you’re having trouble reading it from that distance. High glare from computers can also cause strain, so it is a good idea to install a glare protector on your screen as well. Lastly, adjust the brightness and contrast on your screen so it isn’t significantly brighter than your surrounding light sources. Once you have your workspace optimized, it is also important to rest your eyes throughout the workday. Doctors recommend the 20-20-20 rule: focusing on something 20 feet away for 20 seconds out of every 20 minutes. If you find that this isn’t sufficient, you can even get up and take a quick walk around the office from time to time, which will give you a complete break from the light of your screen. Set your desk up to include a small humidifier or eye drops if you find your eyes frequently getting dry. In addition to the above steps, it’s important to receive regular eye exams and wear glasses or contact lenses with a proper fit as recommended by your doctor. Ensuring proper eye health will help keep your eyes working as needed for the rest of your life. The doctors at Eye Group encourage you to visit us today and let us help you if you are having eyestrain or dry eyes. Don’t let your workday be uncomfortable and damaging for your eyes, let us help you get a new look at life today!